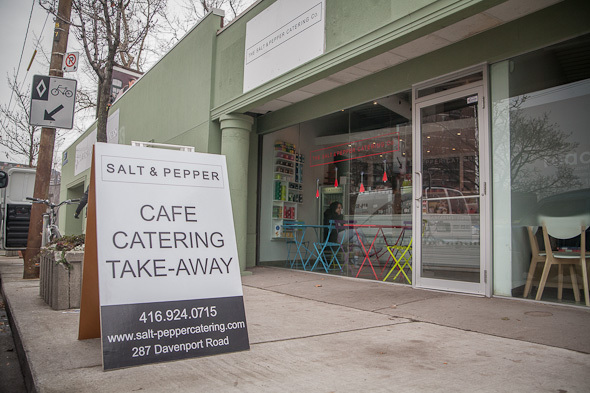 Salt & Pepper has gone from concept catering to a fully fledged cafe at Davenport and Bedford Road in the Annex . A fully fledged cafe, that is, with just six seats; but never mind. 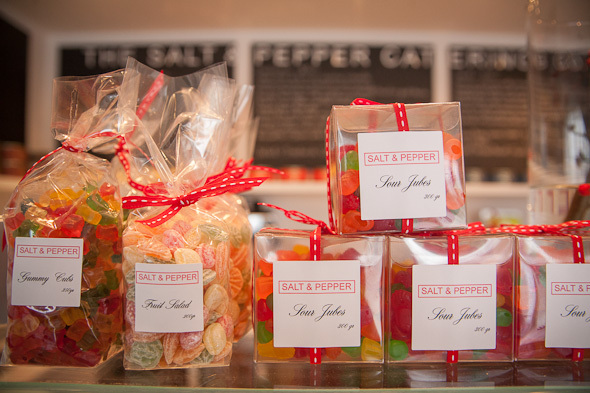 "We're really more for take-out," says Salt & Pepper founder Stefanie Tortorella. "But we do have our regulars, and some of them like to stick around." Stefanie started her company about 12 years ago, first operating out of her own kitchen and later, from Cantine just down the road. 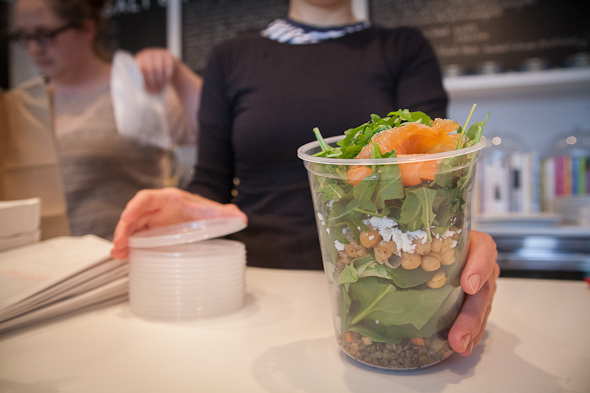 "All we really had there was a bar where people could pick up orders," Stefanie says, referring to Cantine. "But it wasn't really our own, and I really wanted a take-out counter." So when the space formerly occupied by Caz's Great Fish was suddenly available, Stefanie jumped at the opportunity to move just down the road. "It's surprising," says the friendly staff member behind the counter. "You'd think there aren't a lot of people in the area, but we're swarmed during lunch hour." 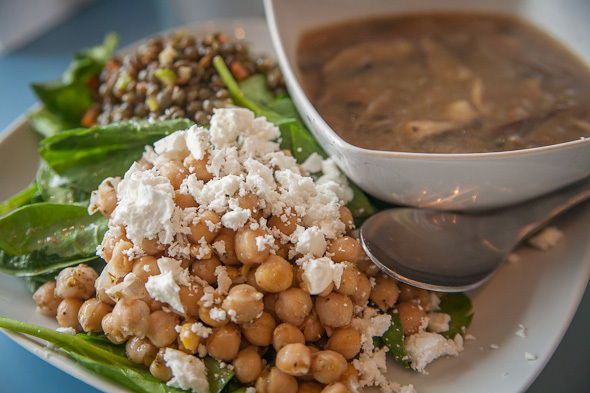 The Salt & Pepper cafe features a daily soup and hot selection every day, along with salads such as its revered red rice and quinoa ($8.00) and sandwiches including its flank steak and cheddar cheese ($8.00) For those who are more interested in a snack or something to grab on the way to work, Salt & Pepper usually bakes three different types of muffins each morning, along with sweet and savoury scones, salted caramel squares (only on Fridays) and its much-lauded "survival cookie" ($2.25). "It's one of those 'everything' cookies," I'm told, and offered a sample. 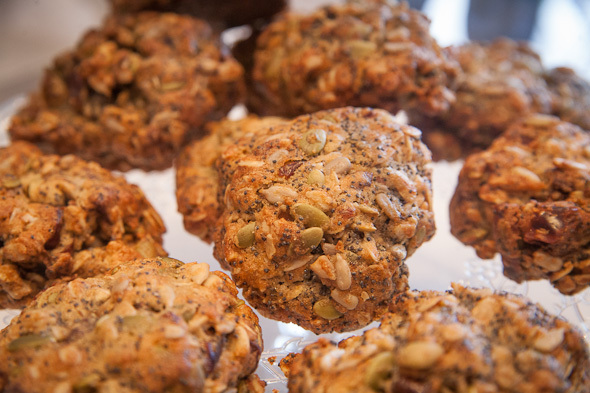 "It has dates, oats, sunflower seeds, pumpkin seeds, chocolate chips â pretty much your kitchen sink cookie." I'd say it's almost akin to a granola bar, but held together with cookie. And quite tasty, at that. It's not ask chunky as you might think with most of the ingredients chopped into tiny morsels, and just enough sweetness from the interspersed chocolate chips. Can I get away with calling it a "breakfast" cookie? Stefanie's baking and cooking know-how comes from years of experience, including training at Le Cordon Bleu in Paris. Initially just a hobby to provide relief from a busy career in the fashion industry, the company has grown to serve all sorts of clients, from the staff across the street at Designers Walk , to the refined palettes (food- and fashion-wise) at Pink Tartan. And while Stefanie's cupcakes are a big sell on the catering end, you won't find them too frequently on offer in the cafe. "There are so many cupcakes everywhere; sometimes we have them, but mostly we're sticking with what we have here," she says. 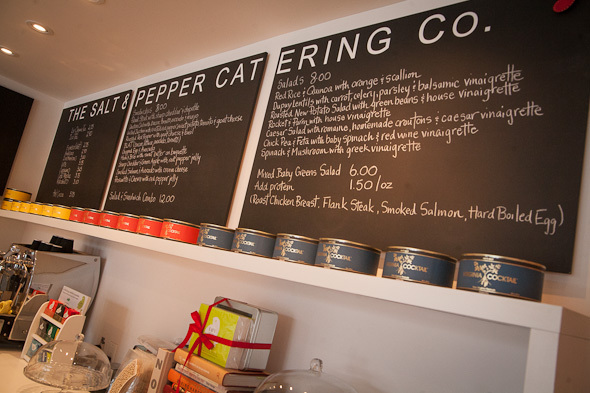 Salt & Pepper usually has a gluten-free baked good or two available each day, though they are baked in the same kitchen as all of the rest of the offerings. 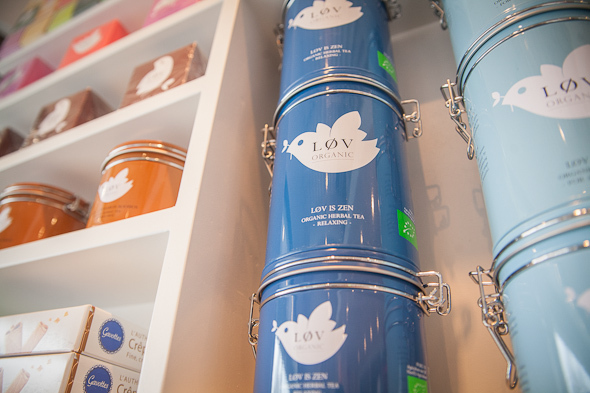 The coffee is an Espresso Institute fair trade blend, with Lov Organic bagged and loose leaf teas available as well. And while there is seating at Salt & Pepper, WiFi is a no-go, so grab-and-go remains the method of lunch and baked-good consumption.